It’s been a long-held dream of many marketers to better engage with customers within their physical premises. But even the old solution of employing more floor staff is unlikely to help if there is no way easy of first identifying who each customer is. Hence the strong current interest in beacon technology. Beacons are low-power transmitters based on Bluetooth low-energy connections that can identify and communicate with consumers over a very short range, such as when they walk into a store. The technology gives marketers the ability to know who is within proximity of the beacon, provided the customer has Bluetooth switched on and has the right app installed. This can translate to a retailer knowing which loyal customers are currently within its premises, and then engage in direct communication them through sending personalised welcome messages and offers. Beacons also help devices know exactly where they are relation to the beacon, enabling very precise geo-location, especially in indoor environments where GPS and cellular triangulation are less reliable. The technology is part of a broader range of technologies dubbed ‘nearables’, due to the fact they only work when the user is in close proximity. This includes the near-field communication (NFC) technology currently used in tap-and-go payment systems, and also a burgeoning range of matchbox-sized transmitters that can be used for anything from tracking lost items to automatically turning on lights or unlocking doors. But it is the ability to identify and communicate with consumers in a precise geographic context that has marketers excited. Numerous beacon trials and implementations have commenced in the past 12 months, including one massive project for the New York Subway which will see beacons deployed as part of a cellular and Wi-Fi rollout across 277 underground stations. Beacons are also being deployed along London’s upmarket Regent Street shopping strip to alert shoppers regarding discounts, promotions and other information, as part of a £1 billion modernisation project. According to Adobe’s senior product marketing specialist for mobile, Ray Pun, his company’s latest Mobile Marketing Survey found that 18 per cent of marketers surveyed were already using beacon technology, with another 36 per cent planning to do so in the next 12 months. This includes brands such as Safeway, American Airlines and Marriott. “This is all focused on improving the customer experience, and so therefore improving loyalty,” Pun says. “The technology is too new to say consumers are demanding it, but certainly there is an expectation of personalisation with any mobile experience. In the case of Marriott, Pun says the hotel chain is deploying beacons that send a welcome message to returning customers, and alerts them to various offers within the hotel. In Australia, several retailers have embarked on various trials, including Chatswood Chase shopping centre in Sydney. Another trial by St George Bank has seen Apple iBeacon devices installed in three bank branches, to send welcome messages and tailored information to customers. That trial is continuing, but a spokesperson said once complete it will be evaluated in detail ahead of a broader national roll out. Numerous hardware developers have emerged to tap into the growing demand for beacon units including US-based company, Estimote, which now ranks Australia as its sixth biggest market. Estimote also makes transmitting stickers, powered by a tiny battery, which can be attached to small objects such as in-store merchandise. The relative newness of the technology means many brands are taking a cautious approach to trialling it. Sydney-based mobile technology developer, TigerSpike, ran trials using beacons earlier year to determine the strengths and limitations of beacon technology, and found immediate benefits in terms of navigation and messaging. However, according to TigerSpike’s commercial innovation manager, Rebecca Pogea, any implementation must be customised to the customer and to the business. “A lot of people have used it ineffectively, and that disenfranchises customers,” she says. Apart from retail environments, Pogea sees strong potential for the technology at events. For example, TigerSpike has created a beacon-based application for attendees at the Future Cities Asia conference, being held in Hong Kong in October. “We have created a companion app for the event that will give information prior to the event, but when people are at the event it will enhance the conversation,” she says. New Zealand-based software and app developer, Boost, has also been trialling beacon technology. Last year it built a loyalty card system, dubbed Royalty, as a demonstration application to replace paper-based coffee stamp cards. Because each beacon has its own unique identifier, the app can determine which shop the consumer is in and present the relevant information through the phone, while automatically updating the customer’s purchase history. While the system is still at the trial stage, Donaldson says Boost recently received interest in Royalty from a coffee and yogurt chain in South Africa. “It’s something people can really buy into and commit to, but having a lot of benefit to the retailer in terms of tracking customer behaviour and at the same time having that permission from the customer,” Donaldson says. She says the technology could also be used to help customers find specified items in large stores. “We see it being beneficial to large retail, such as in a large hardware store where it is really difficult to find stuff,” she says. 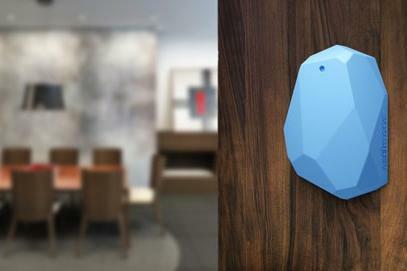 Beacons themselves come in all shapes and sizes, and the use-cases are evolving quickly. The combination of low-powered Bluetooth networking and cheaper electronics has led to a wave of ‘nearable’ devices coming into the market. One of the earliest of these is Tile, maker of postage matchbox-sized beacons that can be attached to luggage, mobile phones, purses or other portable items to aid in their location when misplaced. Crowdsourcing services such as Kickstarter and Indiegogo are now awash with similar devices, which will reach the market in the next 12 months. Tintag is similar to Tile but claims to be the first rechargeable item tracker, while Gablys is a tag with anti-theft technology such as motion sensing and geo-fencing that sends and alert when an item is moved. Signul, acts as a personal beacon that reacts when you enter its proximity zone, such as automatically turning on a light or unlocking a door. The strong interest in beacon technology has also led to a wave of related startups emerging in Australia, such as Xped. Rather than relying on Bluetooth, however, this company uses near-field communication to establish a link to the mobile device when it is bought in contact with the transmitter. Xped’s chief executive officer, John Schultz, says this relieves mobile users of the possibility that they will be bombarded with offers via Bluetooth from every store that they walk past. “The feedback we’re getting is consumers don’t want information unless they decide they want information,” Schultz says. While the technology is initially being developed to control devices in a person’s home, Schultz says Xped could be used within a shopping centre, with customers tapping on when they first enter the centre, then tapping on at their favourite stores to check out what personalised offers they might have. “As you move in and out of areas or shops or precincts you are provided with information that is relevant to you at the time that you’re there,” he says. One of the draw backs of beacon technology is the nature of the technology itself. Beacons are physical infrastructure and as such need to be installed and powered. These leaves them susceptible to vandalism, theft or other environmental mishaps. Realising this limitation, Australian startup, Bluedot Innovation, has worked out a way to create virtual beacons that require no physical installation whatsoever. Instead, they use location information from GPS and mobile towers to pinpoint a person’s location to within five metres, and do so without rapidly draining the mobile device’s battery. This this makes the technology ideal for outdoor applications, and hence it is complementary to beacon technology. Bluedot’s co-founder and executive director, Filip Eldic, says the real benefit of the technology is that it allows virtual geo-fences to be created. Hence once a mobile user with the Bluedot software installed comes within five metres of a selected location an action can be triggered. Because there is no need to install physical infrastructure Eldic says geo-fences can be set up in a matter of minutes. Theoretically it would be possible to set up geo-fences for every traffic light in the Melbourne central business district in less than a day. He says this makes it ideal for applications such as location-based tourism guides, or determining when a vehicle enters or leaves a carpark. Mobile marketing strategy: To app or not to app?